The kitchen is the beating heart of the home, and it will need to be a space where you can cook with confidence if you are to serve up tasty recipes each day. Unfortunately, many homeowners do not have a kitchen which allows them to cook to their best abilities and this can hold you back as a cook as well as make it cramped and stressful to prepare food each day. Cooking is a lot more enjoyable and successful when you have a neat, spacious and well-organized kitchen to work in, so read on for a guide to remodeling your kitchen to improve your cooking abilities. First, you should think about what style of kitchen that you want, and this will depend on your personal taste and the decorative style of the home. You could opt for a more traditional country style kitchen with rustic wood, a minimalist style where less is more or something more modern with sleek surfaces, bare countertops, and so on. These are just a few of the styles, but there are many more to consider, so you should easily be able to find one that you like! Next, you should think about the ideal layout for your particular kitchen. It will depend on the space that you have, but many chefs find that they work best when they have a “classic work triangle,” which involves the stove, refrigerator and sink in a triangle. This is because these are the three most used areas and arranging them in a triangle will reduce the number of steps that you have to take. You will also need to consider the work counters as you will need plenty of space so that you can comfortably prepare the food while cooking. In addition to the size and positioning of the kitchen countertops, you will also need to think about the material, and this will depend on the style that you want to use. After this, you should decide what appliances you will need in the kitchen. It is likely to include an oven, stove, refrigerator, sink, toaster, and kettle, but there are a few additional ones to consider. You will need to make sure that you have enough room to use all of these safely and that you have enough space to open the oven door. You need to have space to move around in the kitchen, and other people may need to come through while you are cooking. 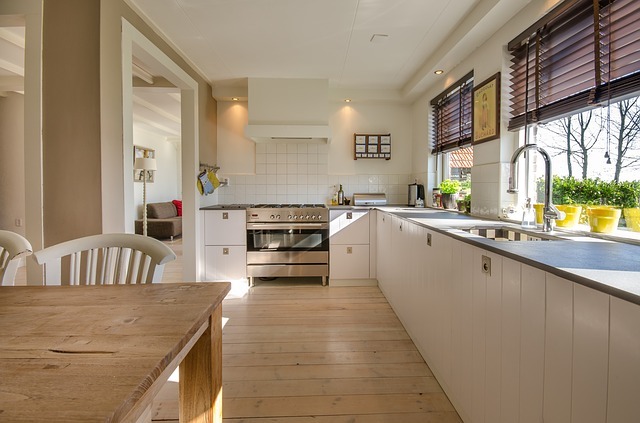 Leave adequate floor space because otherwise, the kitchen will be cramped and create a stressful cooking environment. Two of the most overlooked areas of kitchen design are lighting and ventilation. It can be of great help to have natural light cascading through and having a window can provide important ventilation as it can get hot and smokey without this. A great solution is to have at least one large window in the kitchen which allows light and fresh air to flow through. Around this time you should start to think about a preliminary budget. Remodeling the kitchen can be a huge expense so you need to think about how much you can afford carefully. Although expensive, you will not want to opt for poor quality as this is an area of the home that you will use multiple times a day and a high-quality kitchen will help you to cook better food (and lead a healthier life!). Many homeowners find it helpful to take out a loan to cover the cost of a kitchen remodeling as it can be a significant expense which can impact your finances in the short-term. A loan is a great solution, and even if you do not have a good credit score, you should still be able to qualify for a loan from certain providers. You can learn more about this when you read this page. Next, you will want to find a contractor to take on the project. It is a good idea to research online for those that specialize in remodeling kitchens and to look for those that have high ratings and good reviews. Once you think you have found the right person/team for the job, you can talk to them about your design plan and get estimates for the work. Before work begins, you may need to apply for construction permits if the job involves demolishing walls, utility lines or window openings. The work can now start, so you will want to order your cabinets, appliances, light fixtures and anything else that you need and store these until they can be fitted. A kitchen remodeling can be a messy, stressful and time-consuming process, so you will also need to think about living arrangements during this time. You could continue to live in the house and find alternative eating plans each day or temporarily find somewhere else to live until the work is complete. Either you or the contractor can then finish the work, which will involve moving everything into position, painting and making any decorative touches. Once the kitchen is complete, you will then be free to start cooking meals and enjoying your new space. Crucially, make sure that you are giving the kitchen a thorough clean on a regular basis so that it continues to look its best and that you are cooking in a hygienic and well-organized space. If you are serious about cooking, then it is vital that you have the right space to make delicious food. It can be hard to be a great chef when you are working in a cramped, messy and poorly organized kitchen, which is why it is worth remodeling your kitchen if you are currently unhappy with the space. It can be a significant and costly operation, but as the most important room in the house, it will have a massive impact on your life and allow you to enjoy spending time in the kitchen preparing food and trying new recipes.